As hundreds of grommets have made their way to the Gold Coast we thought what better time to send our work experience gal Stevie Alger off to have a chat with some of the juniors competing over the next few days. First up is one of the early round winners of the Occy Grom Comp. Alyssa Lock, a name you will want to remember. She is the young 13 year old Roxy athlete from Banora in NSW who is making her way through the surfing world on her way up to becoming an elite surfer. Alyssa has already made history as she was the youngest surfer to compete in a professional event when she competed in the Roxy Pro at Snapper Rocks earlier this year. Earlier this week I talked with Alyssa Lock and asked her how does she live the normal life of a 13 year old when she is making history in surfing. How does a 13-year-old manage surfing and schooling? I actually love school but I try to find a good balance so that my surfing doesn’t suffer. I dedicate a few mornings a week to training and most afternoons I will go out for a fun surf. At night after dinner is when I settle down and do my homework. I am lucky because my teachers and my school are very supportive of my surfing and I do my best to repay them by giving everything I can when I'm there. 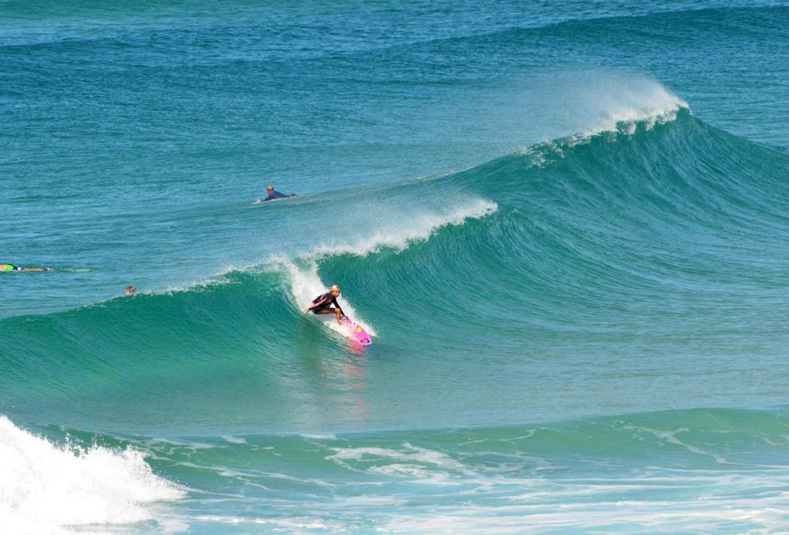 Tell us about competiting in the Roxy Pro Trials this year? Being the youngest girl ever to be in the Roxy Pro Trials was incredible. It was exciting and I will never forget the nerves coming up to the event. It will be a life time memory I will never ever forget and I am so grateful to have been given that opportunity. My family and my really close friends motivate me more than anything. Knowing that they believe in me and try to do everything they can to help me succeed motivates me to do well, to make them proud of me. And knowing that they will support me no matter what the outcome, gives me confidence to never give up. You're sponsored by Roxy, do the older girls on the team inspire you to get where they are? I take so much inspiration from the Roxy Team. 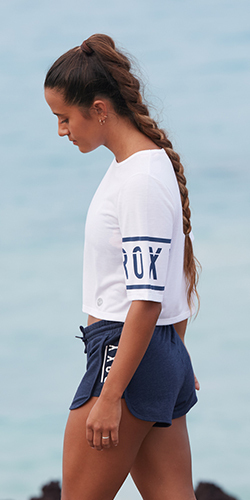 Being a Roxy girl is not only about being a surfer but it’s also a lifestyle. I envy them when I see their instagram photos off on another exotic tropical location always smiling, in bikinis, relaxing with the girls surrounded by the bluest waters. One day I hope to be in one of those shots and my smile will be massive! On top of your surfing what other kinds of training do you do to keep fit? I joined a Surf Club last year because they provided a great training program for all their members. For me it was an opportunity to mix up what I do, to socialise with a different group other than just my surfing friends and secretly just another excuse to be in the water when there aren’t waves. I love it. Do you like to encourage other girls to surf? I do. It’s really great to see your friends carry a board for the first time down to the water and the laughs we have when they are trying to stand up. I also love hearing from other girls who I don’t know but just couldn’t resist giving it a go. If I can I try to answer their messages on instagram and when I have time I check their photos to see how they are going. The best though is watching little tiny girls being pushed onto little shories and seeing them stand up and claim every wave. A pre heat routine can also include waiting. It takes awhile to get through 320 grommets! What's your pre heat routine before a heat? It starts two hours before my heat and it’s a routine I stick to. The last hour goes so fast. This is when I like to be left alone and focus on the surf conditions and start to put together my strategies in the water. When it’s time to get the rashie, I’m there the moment the previous heat is over, I grab it and head straight down to the water so I can have the last few moments alone. When the nerves kick in what keeps you focused and relaxed? I actually surf my best when I'm not relaxed. When I'm nervous or anxious I find I'm switched on and more in tune with all my surroundings, so for me nerves are a good sign because that is when I surf my best. A lot of people are seeing you achieve so much and finding inspiration from you, how does this make you feel knowing that you are inspiring so many people? It’s a great feeling to have someone tell you that you inspire them or you're their idol. I do stop and think to myself… “me? really? !” I still look up to all the girls on the tour and I still say one day I want to be just like them! It’s pretty cool to have someone think the same about me and I hope I can continue to be their inspiration. What's the best part about surfing with friends? The random conversations we have while waiting for the next wave that only we understand. Most of my surfing friends have been competing as long as I have so we've shared a lot of fun times and have many memories. We know each others’ habits in the water and even little face gestures we do that only we know the meaning of. Sometimes we can all be sitting there and start laughing hard about something without hardly saying much to each other and people around us just stare and probably think 'have I missed something here?'. Shortly after watching Occy, maybe? Do you prefer surfing with guys or girls? I have to say surfing with guys has its advantages. Watching them surf pushes me harder because I do my best to hold my own so I take more risks and try to do what they are doing. How is it dealing with your normal life and interviews and photo-shoots? I try not to tell anyone about that side of things. I don’t want them to think I’m up myself so I just keep it simple – they just think I surf, and that’s okay with me. Not many people can say that they have achieved so much at such a young age but Alyssa is only 13 and already has made her mark in history. Not only is she a champion surfer but she has the most contagious smile and the most down to earth attitude towards her surfing and life. 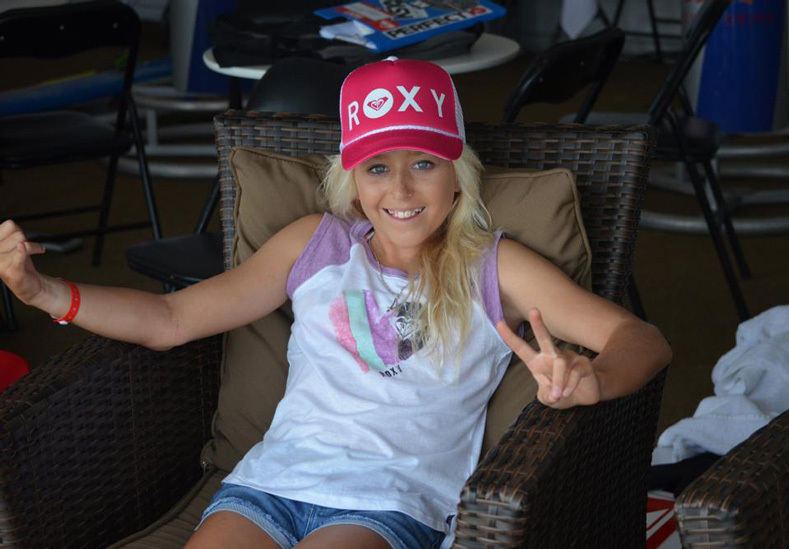 Already a Roxy Athlete, no doubt we will be seeing a lot more from Alyssa in the future.